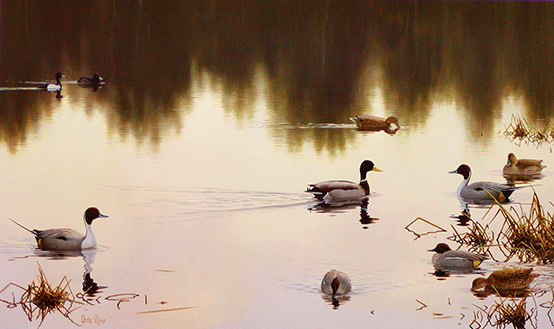 This painting of an assortment of ducks gathering at a lake at the end of the day could be almost anywhere in the Northern Hemisphere – it is nowhere in particular. I wanted to convey a feeling of peace and tranquillity and I enjoyed working with the soft peach and yellow colours that suffused the scene. Painted in acrylics on paper.